Customize and fill this cute caddy with bath and body products, shower accessories or whatever pleases the recipient. Perfect high school graduation gift item. Turquoise and white quatrefoil pattern with fourteen pockets around the tote organizer. Water resistant material. The caddy tote includes free embroidery. Don't Forget Bubble Bath Day - January 8th! 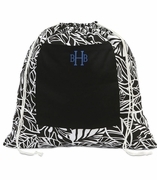 Caddy tote measures 10"H X 8"W and 8 inches deep, lined and washable.